I promise that December will be all about cooking. There will be several new recipes that are challenge approved to start out the new year. In the meantime, here are a few of the November meals I tried that passed muster. 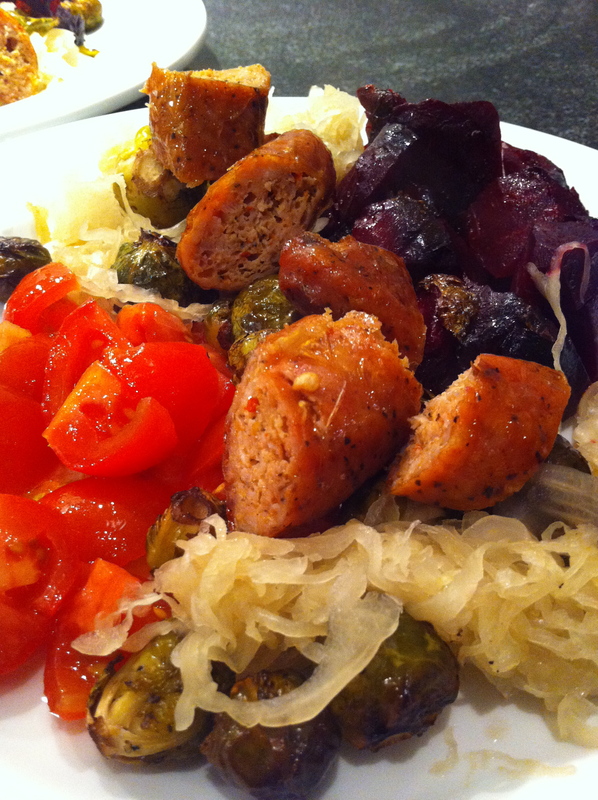 I tried roasting brussel sprouts with balsamic vinegar (a new one for me) and served them with turkey sausage, sauerkraut, roasted beets and tomato. I also made a new carrot soup recipe based on Terry Walters recipe in Clean Food. I started with the basic soup as written but I have to confess I wasn’t sold. It was good, but a bit bland for my taste. 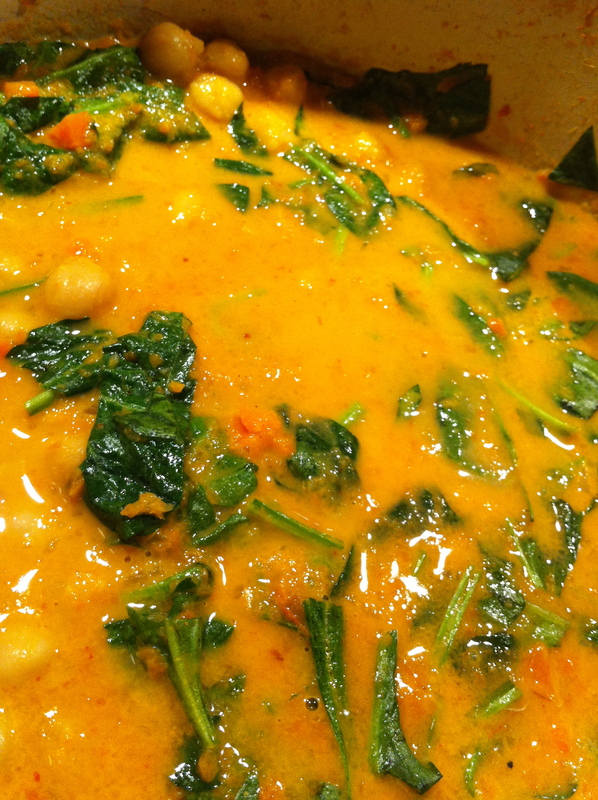 So the next day I added some spinach, chick peas, miso paste and curry powder and got the punch I was looking for. And as with most soups it became even tastier in my thermos for lunch at work the next day. And of course, I tried some noodles. I was attempting to clear off my desk to make room for present wrapping and I found in a (rather large) pile of recipes a page I had ripped out of a magazine years ago for noodles and tomato paste. I thought really? That seems to be too simple to be true. The first time I tried it, I thought, m’eh, okay, not great. The next time I added some chili flakes and it was glorious. 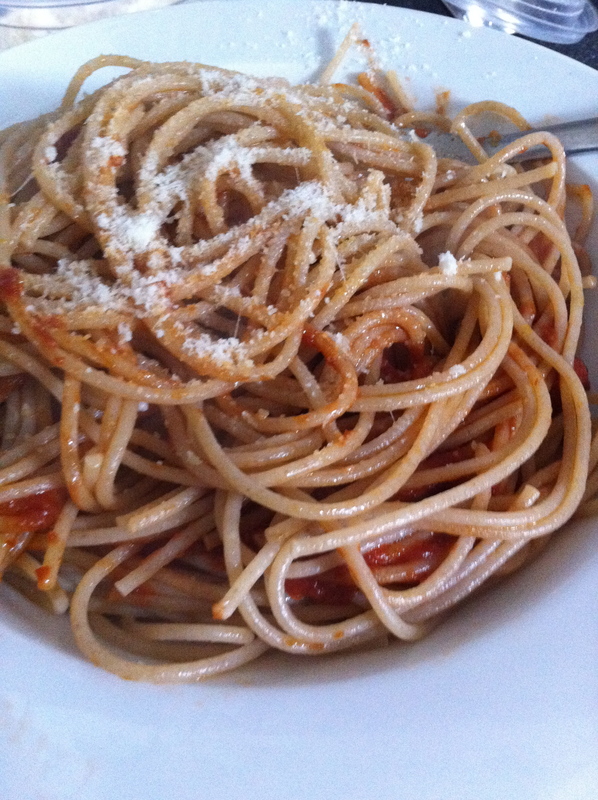 It was a great way to get some carbs after a workout and oh, so very, very simple. The best part is that the potential variations of this recipe are endless. By adding some protein and greens you would have a complete meal in minutes ideal after a day outside playing in the cold. Fill a pot with salted water. Bring to a boil. Add noodles and cook according to package directions. While noodles are cooking heat oil, garlic and chili flakes in a large saute pan. Be careful not to burn them. When garlic is soft scoop in tomato paste and combine. Honestly. That’s it. Enjoy, and please, let me know what recipes you are trying! This entry was posted in Cooking, Lunch, Noodles!, Pasta, Recipe, Soup, Vegetables and tagged brussel sprouts, carrots, chick peas, chili flakes, curry, garlic, kamut, parmesan, sea salt, tomato paste, turkey sausage by mostlynoodles. Bookmark the permalink.